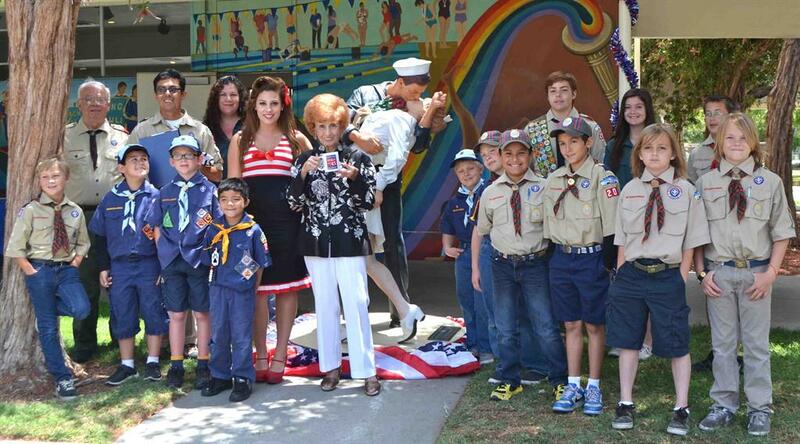 "America's Longest Working Rosie the Riveter"
What is your role as a Spirit of '45 Day national spokeswoman? I was "discovered" by the Spirit of '45 group some years ago. They shared my story with media which led to a lot of interviews with newspapers and TV. The Spirit of '45 group was responsible for Congress unanimously voting in 2010 for a national day for my generation which is observed every year now in August. I've been proud to have been invited to participate as a national spokeswoman and to have this opportunity to promote public awareness about this new national day so more people know about it and participate in it each year in some way. ​ by reminding people of how we were able to overcome difficulties by pulling together. What was it like to retire after working nearly 70 years building airplanes? 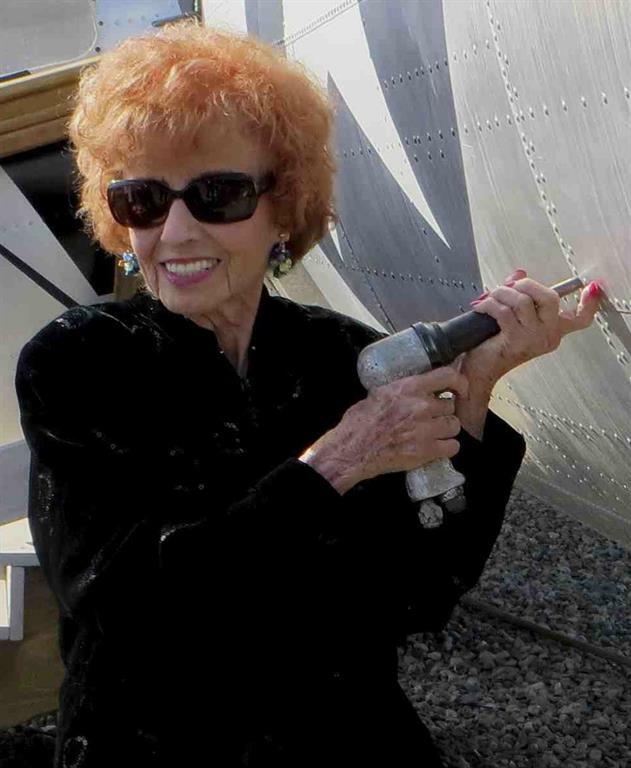 I began my career in 1942 as a riveter working at the Rohr aircraft manufacturing plant in Chula Vista, CA. I still have my first pay stubs to prove it! I never retired. I was laid off at the end of the war in 1945, but later worked with Ryan Aircraft from 1951 to 1964, before joining Douglas Aircraft in 1965, which became MacDonald Douglas and later merged with Boeing. So technically, my career totaled 67 years, with a short period of time when I was out of the work force to have a family. The Boeing plant in Long Beach, CA where I was working is being shut down, and the decision was made to let the more senior employees go first. My section was laid off last November. I was really hoping to continue working there at least for a few more months up to my 50th anniversary at the plant. If they hadn't closed the plant, I'd still be working there. In fact​, since I was laid off, I've actually had a couple of offers to work - as a riveter! 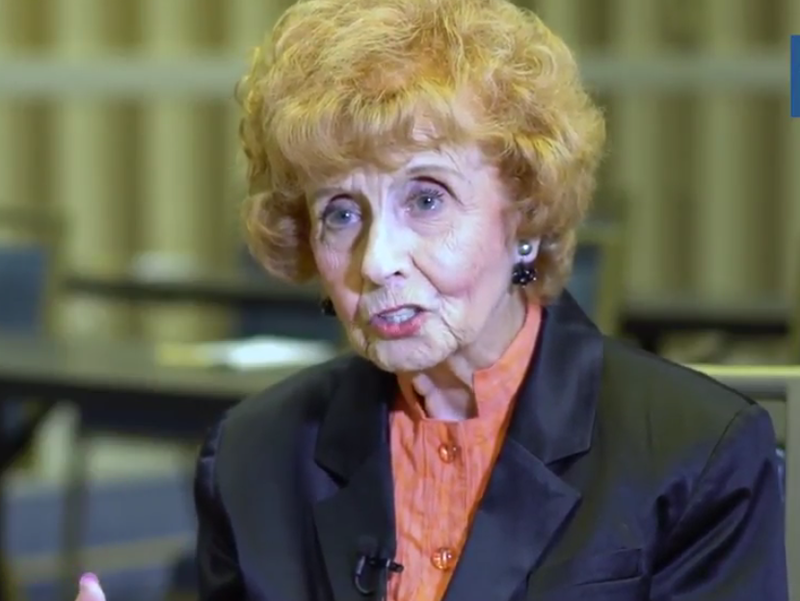 What advice would you give other seniors who are still in the workforce? Do your best to apply your experience and prove yourself every day - your work ethic is the most important thing.​ Sometimes you have to work smarter. And most important: keep a positive attitude. As I like to tell the young people who I meet, "Don't sweat the small stuff." 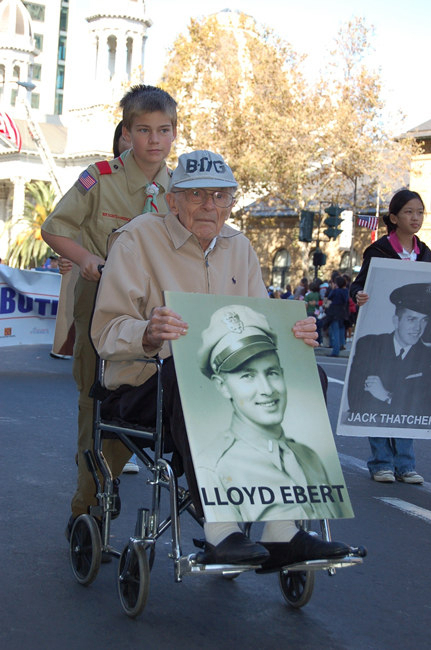 When you think of your life during WWII and being part of the "Greatest Generation," what is one of your strongest or most favorite memories? I think the feeling that we were all making a difference, that way we bonded together and how fulfilling it was to being working hard for the sake of the country, buying war bonds, the music of the time that lifted our spirits, the feeling of being involved in a big adventure together. 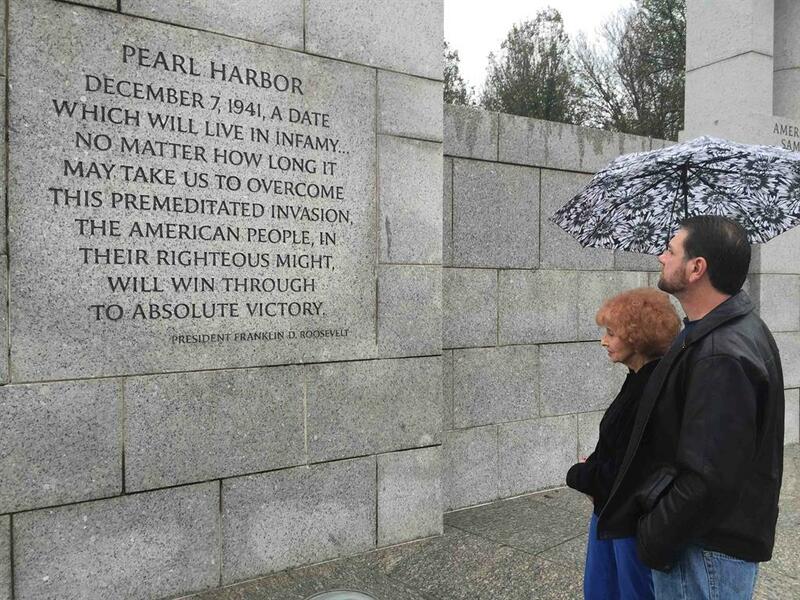 Elinor, with grandson John Perry visiting the National WWII Memorial in 2016. Something else that I like to remember is the fact that ever since I first began working as a "Rosie," in 1942, I actually used a rivet gun. I resisted any suggestion that I switch to clerical or administrative work that was more typical of women's jobs. I was proud to be able to do the same highly skilled manual work as men, even though I was very petite. In fact, the one thing I asked that I be able to take away from Boeing when I left was the rivet gun that I used right up to the day I was let go. I have it displayed on my kitchen counter! You have been on national television and have been meeting many famous people recently as a Spirit of '45 Day representative. What has it been like having so much attention? , and that I should use this opportunity to help make people more aware of all of these women, and to also remind people that age doesn't really matter, and we older people still have much to contribute in so many ways. When you were on the Ellen show, she asked you what you wanted to do when you retire, and you replied, "I want to take care of old people." Now that you're retired, what are your plans to take care of old people? ​Now that I am finally retired, and getting some public attention, I would like to devote myself to raise awareness about this issue.​ Older people have paid their dues, and deserve to have respect, despite their physical or mental problems​. She is younger than me, so it is especially sad to see her in this situation. It has also made me much more aware of how older people often don't receive the quality of care that they need and deserve a​t this time in their lives. Tell us about the Rosie the Riveter rallies that are taking place in August on Spirit of '45 Day weekend? 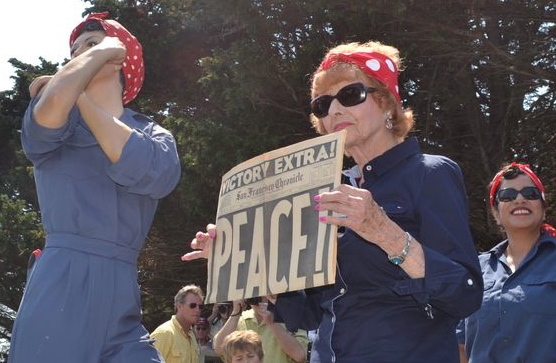 In 2014, the Yankee Air Museum in Michigan set a Guinness World Record by getting nearly 800 women to dressed up as "Rosie's" to help raise money to save and restore the Ford Willow Run Bomber Plant. 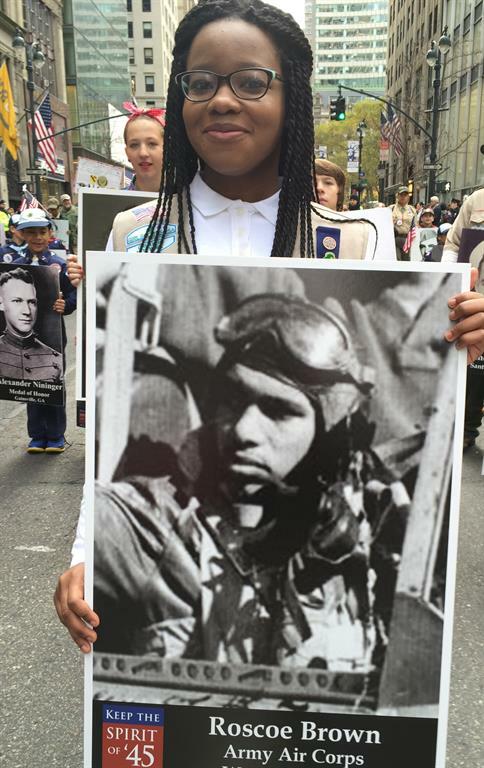 In 2015, the National Parks Service invited women and girls across the country to participate by having "Rosie Rallies" on the second weekend in August as part of the Spirit of '45 Day WWII 70th Anniversary Commemoration. 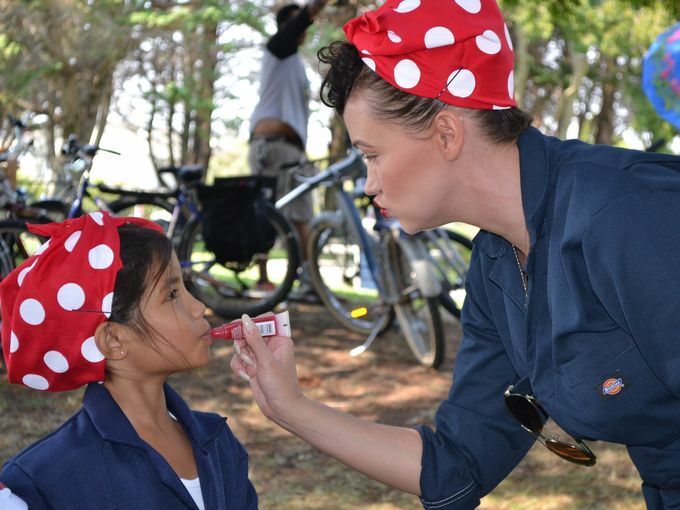 The Rosie the Riveter/World War II Historical Park held their first Rally in Richmond, CA and set a new Guinness World Record when more than 1,000 women, girls and even little babies showed up dressed as Rosie's. 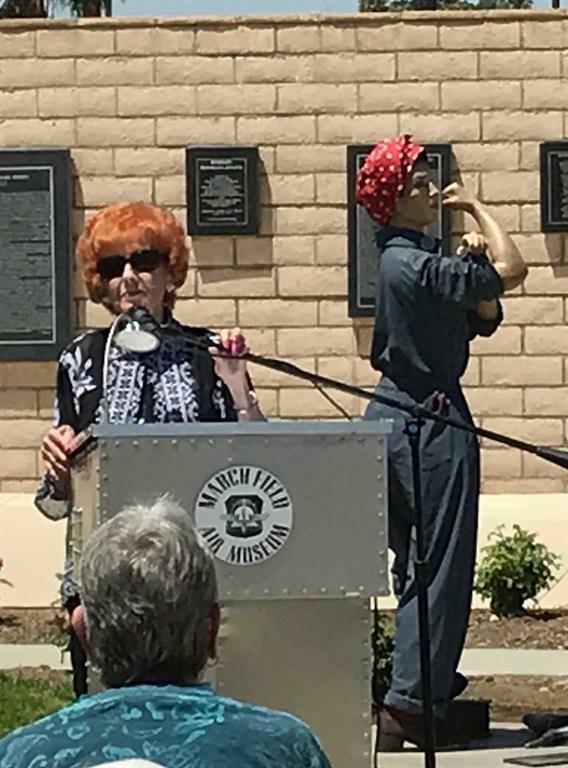 I was invited to attend to help unveil a new sculpture by Seward Johnson which is now touring the U.S. to visit some of the other places that hosted a Rosie Rally like the Frontiers of Flight Museum at Love Field in Dallas, TX. 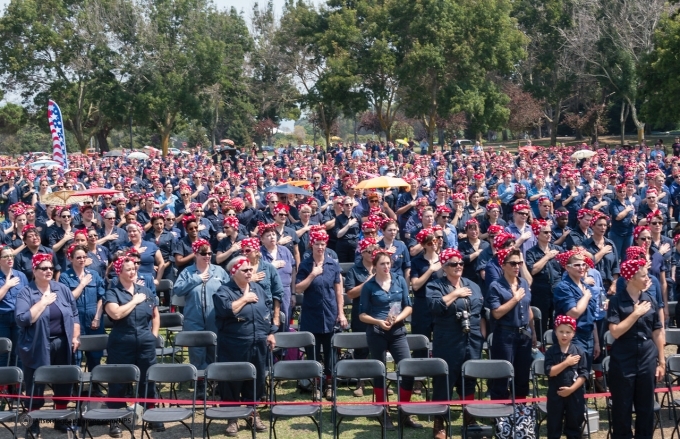 The National Park Service is working with groups like the Association of Rosie the Riveters of America and others to organize Rosie Rallies around the country on Spirit of '45 Day weekend every year. I think they are also setting up a way for Rosie lookalikes to send in their photos and comments so they can be shared with the public. 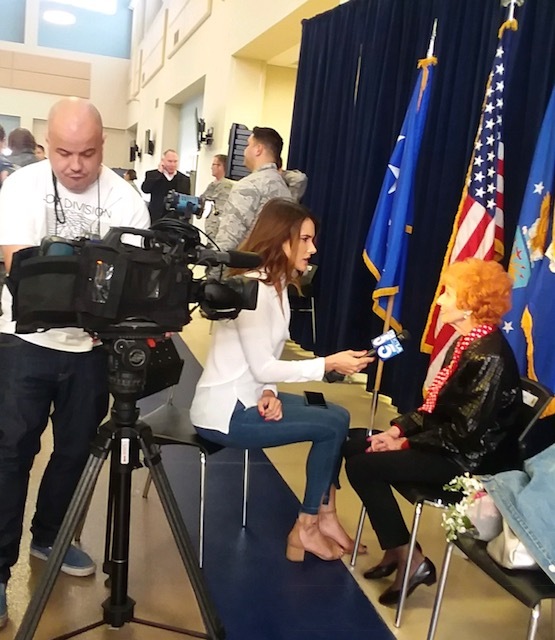 The idea is to draw attention to the contributions that women of America's 'greatest generation" made and how they helped expand opportunities for women in our country. It's also a chance for women of all ages to come together in a show of solidarity for what must still be done to make sure women have equal opportunities. I think it's going to be a lot of fun and am looking forward to seeing all the photos! 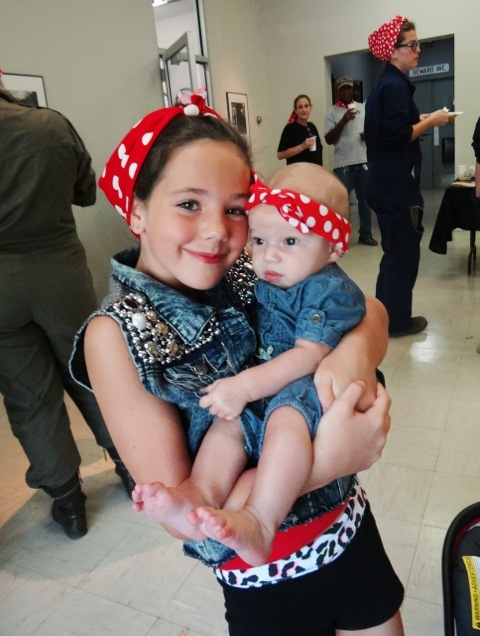 "Rosiestte's" of all ages are being invited to send in their photos in a show of support for preserving and building on the legacy of the Rosie's of WWII. As you meet other "Rosie's" on your travels have you detected any similarities in character or their experience during WWII? Well, we're all very pleased to be getting this special recognition, especially at this time in our lives. And it is fun to share our stories about what we did during the war, and our lives after it was over. and every Rosie felt it was a very positive experience for us to have had as young women and that it shaped our character. What needs to be changed in our society about how we care for seniors? This is a big challenge, as you know, and I am certainly not an expert other than being someone in her nineties who has personal firsthand experience with how older women are treated. I also don't think of myself as very typical of my generation or my age group, as I have been more fortunate that so many others in being able to continue to work maintain my independent life style, and be healthy. I think the number one issue is for people to have patience and love for older people who have contributed so much to this country. It has been my experience when meeting younger people, especially little ones, that they want to show respect to older people because it makes them feel better about themselves to help someone who needs their energy and excitement about the future. This is one of the best parts of what I'm doing now, is getting out to talk with kids and answer their questions about what it was like so long ago! I'm excited that to hear that Girl Scouts are being encouraged to go out and spend time with members of my generation during Spirit of '45 Day in August. 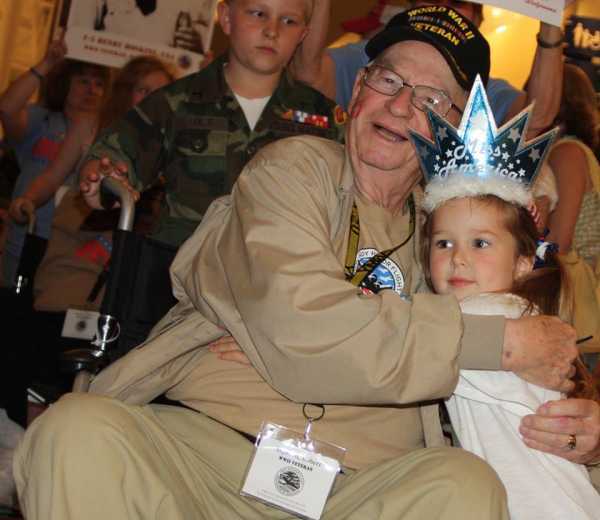 I know the older folks will really enjoy having these young people visit them, and the girls will have a chance to learn from the generation that saw so many changes in their lifetimes. 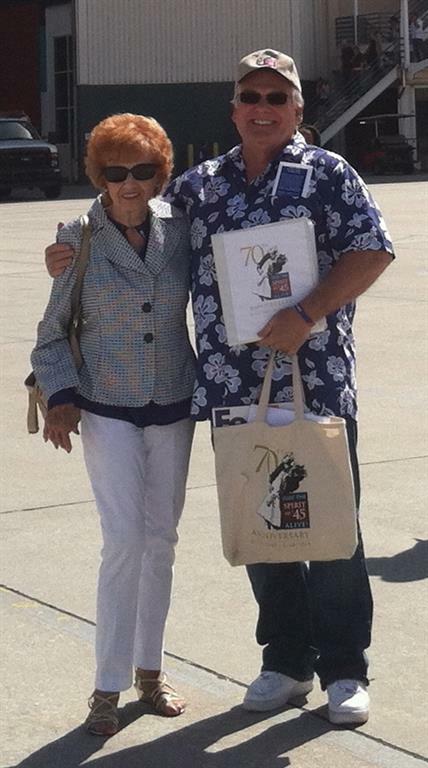 With Warren Hegg, National Supervisor, Keep the Spirit of '45 Alive at Boeing plant in Long Beach, CA. 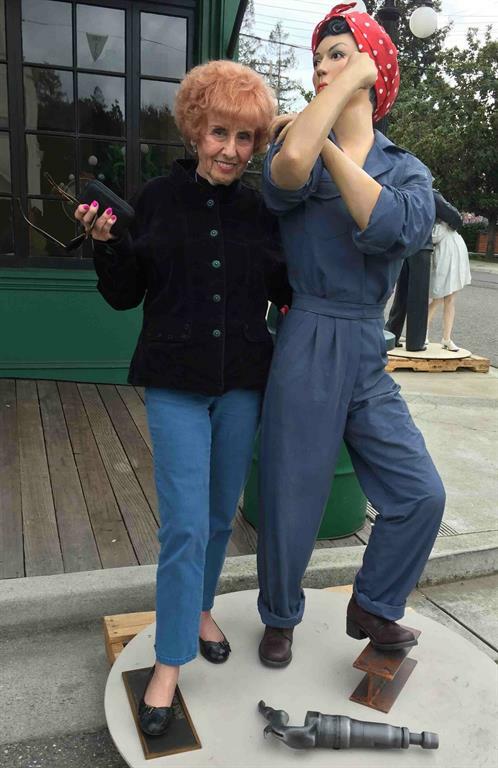 and sculpture Seward Johnson's version of the iconic "Rosie pose" in San Jose's History Park.